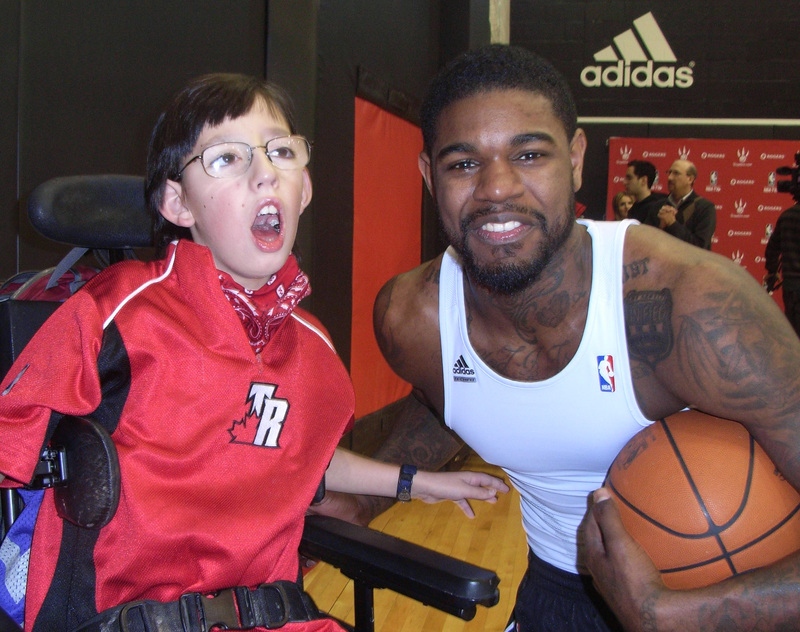 A young Deane with Raptor player Amir Johnson. He remains a huge fan. It isn’t a conscious thing. It’s just become a habit, a form of protection against disappointment. Walking by displays for service agencies, the first thing I do is scan the pictures for people with walkers or wheelchairs. It is surprising how seldom the displays meet my criteria. I recently attended a forum put on by the local Community Living agency. The topic was disabled children turning 18 – an issue I am reluctantly forcing myself to wrap my head around. Community Living’s mission is to support people with intellectual disabilities by helping them find appropriate housing or meaningful work. I went because along with his physical disability, Deane is developmentally delayed and I thought this might help me understand our options. In addition to the formal topics on the agenda, we were encouraged to chat with representatives from the many other agencies on hand. So out I went. Very quickly I found myself standing back from the displays, hesitant to approach and ask my desperate question: what do you offer for those with physical handicaps. The work programs are stocking shelves, washing dishes or other simple, repetitive physical tasks. None of them things that Deane could do. The respite programs focus on art, music, sensory experience and life skills. We’ve tried those – they amount to glorified babysitting. I walked away from the displays more than disappointed. As Deane gets older, finding something that can fill his days becomes more urgent. Feeling a growing anxiety, I joined a small group discussion about creating a meaningful life for our kids. The parents, many of them with older “children” living at home, seemed at as much of a loss as I did. The one glimmer of hope was raised by a young man who had been part of a panel of disabled adults who talked about the challenges and triumphs of living on their own. Answering Yes and No to our questions, he told us about how much he enjoys selling raffle tickets at the Air Canada Centre during Toronto Maple Leaf games. Now, selling tickets at the Air Canada Centre during the Toronto Raptors’ home games, that is something I could see Deane doing. I would love to chat with you about options – Louise K. at BLOOM has all my contact details or you can get in touch via my blog at http://www.donnathomson.com. Your Deane and our Nicholas are so much alike! And selling 50/50 at Ottawa Senators games is Nick’s latest aspiration. We’re working on it. We have a good solution for housing/care – it’s working well for Nick who requires funding from both health and MCSS. Anyway, drop me a line and hopefully we can connect. Merry Christmas! First let me say that you blog is amazing. Very thoughtful and though-provoking (http://www.donnathomson.com/). I would love to chat about both selling tickets and your housing solution. Louise also has my contact info.